Vilhelms Purvītis (3 March 1872 in Zaube, Latvia – 14 January 1945 in Bad Nauheim, Germany) was a landscape painter and educator who founded the Latvian Academy of Art and was its rector from 1919 to 1934. Vilhems Purvītis was born in Livonian Governorate, Zaube parish in a family of a miller. He studied in a local parish school until his family moved to Vitebsk Governorate. Until 1888 Purvītis studied in a municipal school in Drissa (Today: Belarus). It was here where his drawing skills were noticed for the first time. When his family returned to Vidzeme Purvītis worked in his fathers mill in Smiltene parish for a two years. 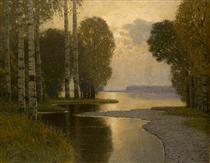 In 1890 Purvītis started studies at the Imperial Academy of Arts in Saint Petersburg, Russia from 1890 to 1897, primarily under Arkhip Kuindzhi, graduating with the Grand Gold Medal. While in academy he studied paintings of old Dutch masters and became close friend with two other Latvian painters- Janis Rozentāls and Johan Valter. 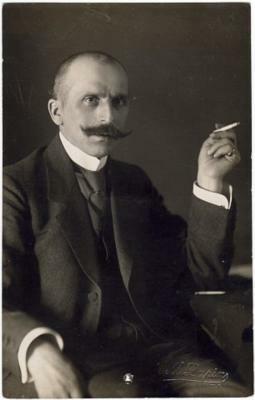 In 1898 he together with Janis Rozentāls and Johan Valter took a study trip across Europe and his paintings were exhibited in Berlin, Munich, Paris, and Lyon to great acclaim. 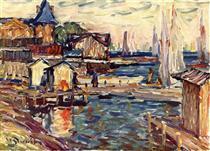 In 1899 he returned to Riga and started to give private lessons in painting. 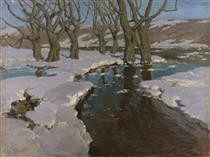 In 1902 he traveled to Spitzbergen in Norway to study the painting of snow. After the Revolution of 1905 Purvītis traveled to Tallinn where he worked as a drawing teacher in a local Realschule. In 1909 Purvītis returned to Riga and became director of a Riga city art school. After the First World War started in 1915, Riga city art school was evacuated to St. Petersburg where it was closed in 1916. After the Russian revolutions of 1917 Purvītis went to Norway to improve his health and held his first solo exhibition in Oslo. In 1918 Purvītis returned to German occupied Riga. In 1919 he became director of a Riga city art museum (Today: Latvian National Museum of Art) and also was one of the founders of the Art Academy of Latvia and was elected as its first rector. As the leader of the landscape painting workshop at the Latvian Academy of Art from 1921 to 1944, of visual arts in the architecture department at the University of Latvia from 1919 to 1940, and director of the Riga City Art School from 1909 to 1915, Purvītis had a host of followers and was the acknowledged leader of a whole school of Latvian painting. During the period of the Republic of Latvia Purvītis also organized many exhibitions of Latvian art in Europe. After Latvian occupation by the Soviet Union in 1940 Purvītis was dismissed from the post of museum director but continued to work in the Art Academy. In 1942 his last exhibition in Riga was held. In 1944 Purvītis lost all of his belongings and many of his works when his house and workshop was destroyed during the Battle of Jelgava in the summer of 1944. Purvītis was forced to evacuate to Liepāja and from there to Danzig. Wilhelms Purvītis died in January 14, 1945 in Bad Nauheim, Hessen. Purvītis' remains were reinterred at the Riga Forest Cemetery in 1994, after Latvia regained its independence. He was awarded with the Order of three stars (III and II class) and many more decorations. Kūstošais sniegs Vilhelms Purvitis ? Agrs pavasaris Vilhelms Purvitis ? 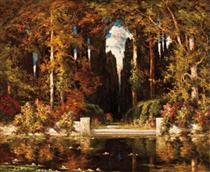 An Italianate Landscape Vilhelms Purvitis ? Lake in Early Spring Vilhelms Purvitis ? Orthodox Monastery in Latvia Vilhelms Purvitis ? unknown title Vilhelms Purvitis ?